We plant fruit trees at our homes for the purpose of harvesting the reward of incredibly delicious tree ripened fruit. Why not extend this pleasure from 2-3 weeks to 10-12? HOW? : The homeowner can produce three or four different fruit tree crops in slightly more than the space of one tree. 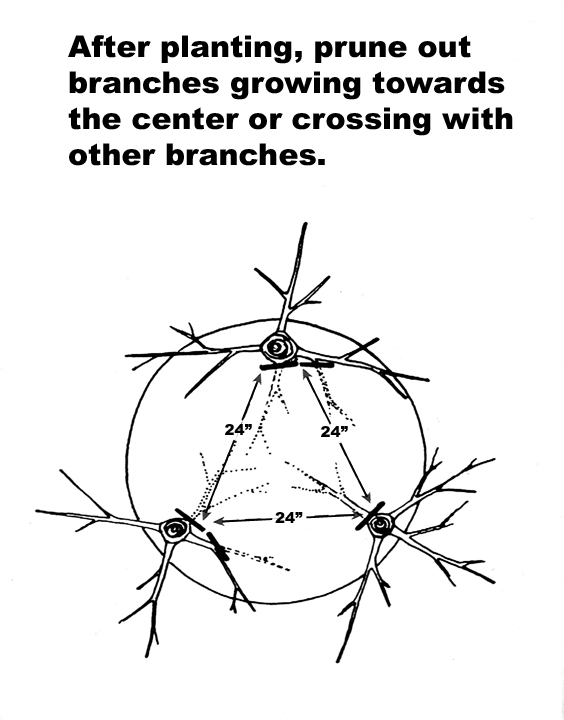 The trees should be planted in a triangle (or box for 4) 24" apart and at a slight outward angle. 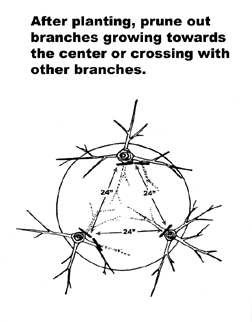 The center limbs are pruned so that crossing limbs are removed. Otherwise, normal care is all that is necessary. Pick a combination of varieties that are similar in growth habit and foliage texture. Varieties can be selected for mild winter areas, traditional fruit growing areas, mountains and deserts. Why not fruit all summer long? Some ideas for a pleasing selection are listed below. Where pollination is required, include varieties that pollinate each other. For example, if you plant Early Ruby, Black Tartarian and Bing Cherries, you have varieties that pollinate each other and provide an abundance of cherries from Late May through Mid-June. Almonds: Ne Plus, Nonpareil and Texas Mission. Apples: Red, Green and Yellow or Early, Mid and Late Season. Apricots: June, July and August ripening. Cherries: Early June ripening, Mid June ripening and a Sweet Pollinizer. 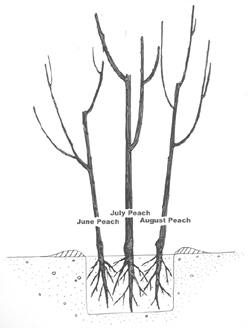 Nectarines: June, July and August ripening or a White fleshed variety. 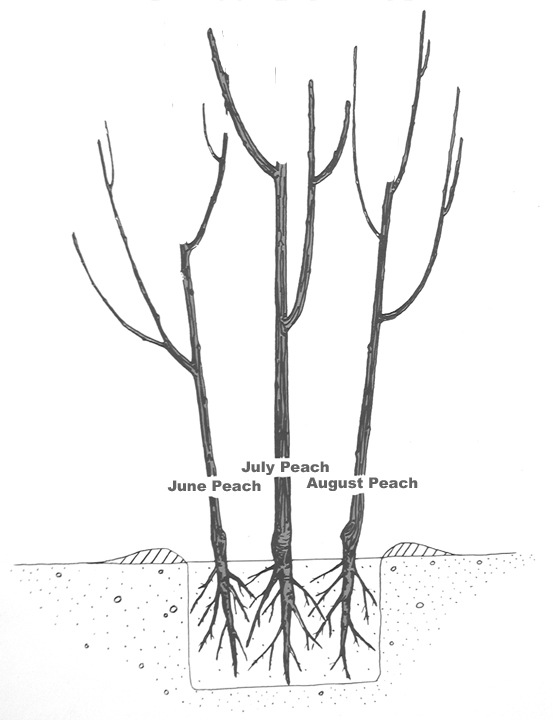 Peaches: June, July and August ripening or a White fleshed variety. Asian Pears: July, August, September ripening. Domestic Pears: Early Season, Late Season, Red Skin. Plums: Red meat, Purple meat and Yellow meat.